Today I'm continuing with my Brand Spotlight Series and sharing a new name that I can't be more excited about! Wallis Evera prides itself on creating clothing that is the right fit, colour and style for your body. They are completely eco-friendly as it requires less energy and water when processing the hemp used to make their clothing compared to cotton typically used by most brands. It's also more durable and long lasting so you know you're investing in quality pieces that will last. I'm also very proud to say the pieces are cut and sewn in my very own city of Vancouver, which means fair wages for all those involved! I chose a button-up collared top from Wallis Evera because there are so many different ways you can style it. In this post I chose to tuck it into jeans but it can also be styled with skirts, leggings or tied over a summer dress. It even has the versatility to be worn in the work place which is always an added bonus for me. One thing I learned from observing Parisian street style is that the women dress effortlessly chic. A button-up white collared shirt, denim and a pale pink trench is the perfect understated yet stylish look that can be worn for many occasions! Not only is it practical with its comfort and ease, the subtle injection of colour separates it from being completely unimaginative and boring. See my second look with Wallis Evera here as I share my visit to the Palace of Versailles and a few styling tips for dressing like a Parisian. This post is brought to you by Wallis Evera. All thoughts and opinions are my own. Hi Rina, I so love the whole look. Especially that top and your pink coat and the bag!!! You look gorgeous, girl. I love how french women dress up. They are like you've mentioned so effortless and chic. I also love the fact that this brand is eco-friendly. I do love how styled this button down shirt, such a classic piece to have in the closet. Love this post! Love how you make it magazine editorial look like. What a cool brand! I love that they are eco-friendly! Hola guapa muy buenas tardes, me encanta tú look pareces de catálogo, la chaqueta en rosa palo es preciosa. Un besazo fuerte. Love the look. You look amazing! I adore this look- the blush duster is too cool! This outfit is so beautifully styled! I love the pink duster! Beautiful as always! Love your shoes and bag! This whole look is seriously so chic and gorgeous! I love that top and that pretty duster on top! All your accessories are the perfect details! Very chick!!! A nice touch of pink. As usual your styling is perfect.Your slides are to die for and I really love your coat. I love these photos, so chic! Hope you en enjoyed your time in Paris! Sounds like a great brand! I really love the shirt. In love with entire outfit!! So cool! Absolute perfection! I love every bit of this look! Love your top! And coat. Perfect style. You look incredible! Sounds like an awesome brand! 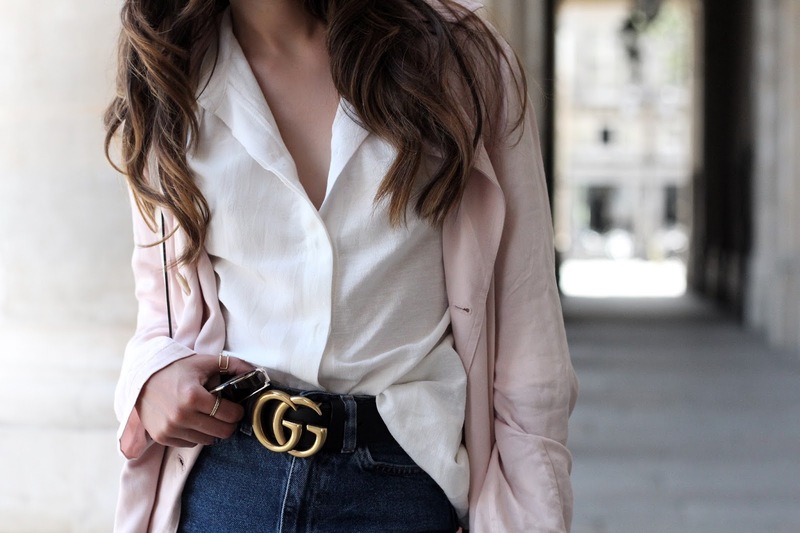 Love your top and the pink and white with your gorgeous Gucci accessories. I would definitely wear this outfit, it's so lovely! Hi Rina! Love the loose pink trench - so gorgeous. I love this outfit, especially the Gucci belt! !